Your cat or dog may display quite an impressive set of teeth -- but how healthy are those teeth, and the other oral structures surrounding them? Pets need dental care just like their human owners do, and that's why owners need Cats and Dogs Animal Hospital. From a routine (but important) dog or cat dental cleaning to treatments that can help save your pet's teeth and health, we're delighted to provide your pet with the means to enjoy a lifetime of happy, comfortable chewing. It's no secret that we humans can be less than perfect regarding our own dental maintenance, and it can be even easier to forget scheduling an annual cat or dog dental exam. But pets can face some serious diseases, disorders and other problems involving the teeth, gums, and oral cavity. The most common of these is called periodontal disease. This inflammatory gum disease usually begins when bacteria flock to tartar, a hard-to-remove substance made of old food debris. Periodontal disease may cause painful or bleeding gums, foul breath, swelling, pus, and bone or tooth loss. A tooth infection or injury may also cause major problems. Cracked or broken teeth are not only painful, but they also allow bacteria to infiltrate the root canal. Last but definitely not least, pets can develop oral cancer, a potentially fatal disease. Regular dental exams give us the opportunity to find those problems and nip them in the bud, long before they can trouble your pet or threaten his health. Visual evaluation and dental X-rays can reveal the presence of lurking problems in their earliest stages. As part of the dental checkup, we can administer a dog or cat dental cleaning under anesthesia. These cleanings make use of specialized tools to scrape even tough tartar away from the teeth. 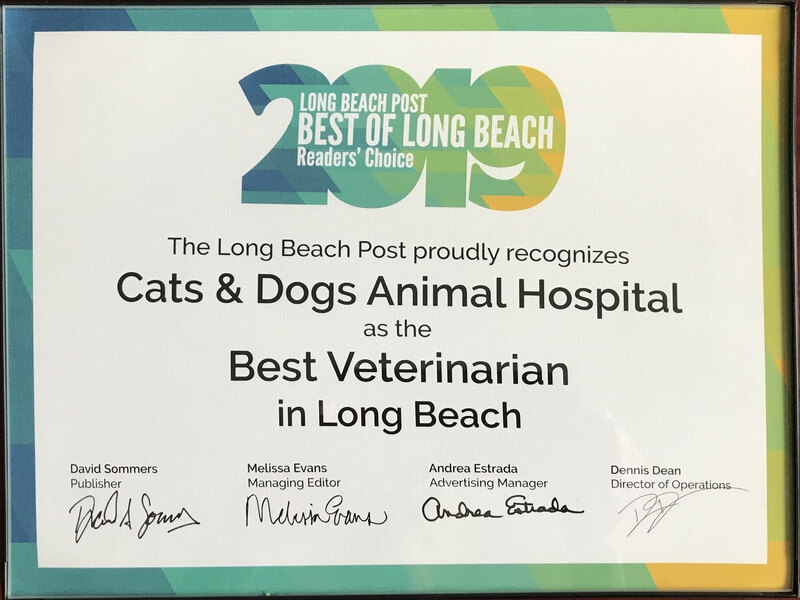 Despite your best efforts to prevent dental problems, trouble can sometimes occur -- and that's when it's good to know that your Long Beach veterinary team can fix it. We can clear up bacterial infections with prescription antibiotics and other treatments, for instance. If need be, we can extract a seriously diseased or damaged tooth for the sake of the other healthy teeth. If your pet has a lump that might prove cancerous, we can surgically remove it for biopsy. A confirmed case of oral cancer can then be treated with additional surgery or other potentially life-saving methods. Need to Schedule a Pet Dental Check up or Treatment? Now that you know more about dental problems in pets and how we can prevent or treat them, take action to help your pet maintain a healthy mouth. Is it time for your special friend to come see us? Schedule a pet dental checkup or treatment for him at Cats and Dogs Animal Hospital. Call 562-439-4228 today!